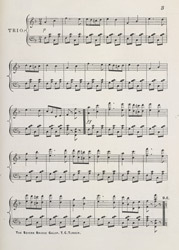 Popular music of the 19th Century often took inspiration from contemporary events. The building of the suspension bridge across the Avon Gorge was a great achievement. Designs originally produced in 1793 suggested the erection of a stone bridge which would include a museum, library, and corn exchange. However, it was realised that an iron suspension bridge would be cheaper and Isambard Kingdom Brunel's design won the competition. The illustration is very different to the actual bridge as work started in 1831 and was not finished until 1864, so the artist created an impression of what it would look like.